While some supermarkets just use them to get rid of old stock, free samples come at a cost for vendors desperate for consumers to take a taste. KIRKLAND, Wash. (TheStreet) -- Handle that cocktail frank on a toothpick with care the next time you're taking a taste at the end of a grocery aisle: Someone may have a lot invested in that free sample. Those little card tables full of plastic tasting cups or stands serving skewered samples of various products are fixtures of supermarket marketing as old as sign-coated end caps and shrill "attention shoppers" PA announcements, but are still as effective as they were the first time someone sprayed cheese on saltines and put them on display. In recent years, however, they've evolved into sleek, sophisticated portable displays that are as much about brand building as they are about giving customers free bacon substitute or bagel chips. Supermarket analyst David Livingston says samples such as midshopping shots of juice and precheckout chunks of cheese are a recession-proof common denominator among successful supermarkets including Whole Foods ( WFMI, Trader Joe's, Safeway ( SWY and Wegman's. There's more to that free sample than you know -- for instance, it may be food a few days away from expiring or a premium product costing manufacturers $355 a day just to give away. "Some stores can't afford not to give out samples," Livingston says. "It's something the customer has come to expect." They're also a relatively cost-free way for a grocery retailer to give the consumer a little something extra. Livingston notes that it's common practice among many supermarket chains to take popular items that are a week to a few days away from expiration and cook them up for customers rather than toss them into the trash compactor out back. Companies who've played the grocery grazing grounds game before are becoming increasingly aware of their customers' fanaticism about freebies and are reserving the best spots for those willing to shell out. Costco ( COST - Get Report), whose free samples have been part of the zeitgeist since MTV's Daria mocked the masses clawing at each other over free fried cheese at the local mega-mart, spun off free samples into a separate industry. 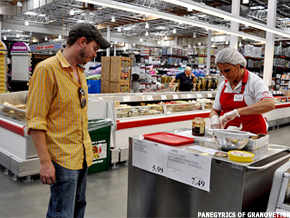 Since the late 1980s, Costco has farmed its free-sample work -- or "demonstrations," as the company refers to them -- to second-party firms that serve as gatekeepers to the stores and staffing agencies for the vendors. San Diego-based Club Demonstration Services, for example, has handled free samples for Costco locations at 35 states in the Northeast, Midwest, South, Southwest and Puerto Rico since 1988. If a vendor wants colorful little cups of its newest of myriad fruit juice varietals available to Costco shopper, the entry-level buy-in rate is $150 for one staffer and 6.5 hours of service -- with a $7.50 additional charge for toothpicks, skewers, cups, spoons, plates and the like. That charge jumps $26 for each additional hour and surges to a $170 starting price if there's more than one product involved. Want a piece of a store's swollen opening day take? That charge jumps to $340 for a full day and $15 for supplies. It's not much cheaper on the West Coast, where Warehouse Demo Services has been helping such companies as Kraft ( KFT, General Mills ( GIS - Get Report) and Procter & Gamble ( PG - Get Report) hand out their wares at Costco location in California, the Pacific Northwest, Hawaii and Alaska since 1989. The cost of doing business there is also $150 per day and $170 for two vendors. Not to be left out of the fun, Wal-Mart ( WMT - Get Report) and Sam's Club dumped their 10,000 in-house sampler jobs and gave them to independent firm Shopper Events. So what does it cost Unilever ( UL, Keebler and Nestle to put some Hellman's mayonnaise, Chips Deluxe cookies or DiGiorno's pizza into shoppers' mouths? It's $200 to $240 per store at Wal-Mart, but Sam's Club is open to negotiation. Oh, and companies still have to give out samples in carts with a giant Wal-Mart or Sam's Club sign above them. If that seems a bit steep, keep in mind that getting a customer to even try a product is the biggest part of the battle -- with companies spending more than $94 billion in advertising alone last year just to get people to consider a product they may never have sampled, according to Kantar Media. With the free sample, a company gets the customer to try a product without putting up a price barrier, while the customer gets a "free" item while not having to gamble a portion of that week's grocery bill on a product they may not even like. With all of that on the line, Livingston says dedicating sample-specific personnel and resources toward putting a supermarket's best foot forward is an investment everyone ends up enjoying. "Retailers who do this for a while have samplers employed and put a little extra effort into giving out their samples," he says. "You can tell if a smaller retailer hasn't done much sampling if there's just a teenager behind a card table with toothpicks."